Click here for detailed analytics of jobsinpakistan.xyz ? How much is jobsinpakistan.xyz worth? Description Visit our site to check Govt Jobs In Pakistan For Teachers, PPSC Jobs Today, Jobs In Pakistan 2018, Latest Jobs In Pakistan 2018 and Others Jobs. Your server IP(184.168.131.241) is not blacklisted. 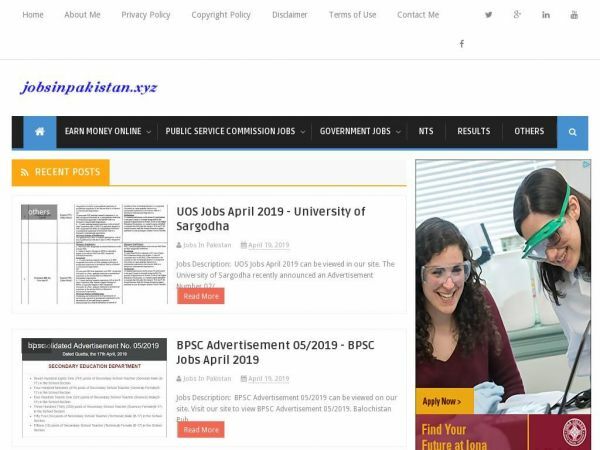 Domain Name: JOBSINPAKISTAN.XYZ Registry Domain ID: D71586460-CNIC Registrar WHOIS Server: whois.godaddy.com Registrar URL: https://www.godaddy.com/ Updated Date: 2018-12-04T10:53:45.0Z Creation Date: 2018-07-08T06:39:30.0Z Registry Expiry Date: 2019-07-08T23:59:59.0Z Registrar: Go Daddy, LLC Registrar IANA ID: 146 Domain Status: clientRenewProhibited https://icann.org/epp#clientRenewProhibited Domain Status: clientTransferProhibited https://icann.org/epp#clientTransferProhibited Domain Status: clientUpdateProhibited https://icann.org/epp#clientUpdateProhibited Domain Status: clientDeleteProhibited https://icann.org/epp#clientDeleteProhibited Registrant Organization: Registrant State/Province: Punjab Registrant Country: PK Registrant Email: Please query the RDDS service of the Registrar of Record identified in this output for information on how to contact the Registrant, Admin, or Tech contact of the queried domain name. Admin Email: Please query the RDDS service of the Registrar of Record identified in this output for information on how to contact the Registrant, Admin, or Tech contact of the queried domain name. Tech Email: Please query the RDDS service of the Registrar of Record identified in this output for information on how to contact the Registrant, Admin, or Tech contact of the queried domain name. Name Server: NS43.DOMAINCONTROL.COM Name Server: NS44.DOMAINCONTROL.COM DNSSEC: unsigned Billing Email: Please query the RDDS service of the Registrar of Record identified in this output for information on how to contact the Registrant, Admin, or Tech contact of the queried domain name. Registrar Abuse Contact Email: abuse@godaddy.com Registrar Abuse Contact Phone: +1.4805058800 URL of the ICANN Whois Inaccuracy Complaint Form: https://www.icann.org/wicf/ >>> Last update of WHOIS database: 2019-04-25T04:44:38.0Z <<< For more information on Whois status codes, please visit https://icann.org/epp >>> IMPORTANT INFORMATION ABOUT THE DEPLOYMENT OF RDAP: please visit https://www.centralnic.com/support/rdap <<< The Whois and RDAP services are provided by CentralNic, and contain information pertaining to Internet domain names registered by our our customers. By using this service you are agreeing (1) not to use any information presented here for any purpose other than determining ownership of domain names, (2) not to store or reproduce this data in any way, (3) not to use any high-volume, automated, electronic processes to obtain data from this service. Abuse of this service is monitored and actions in contravention of these terms will result in being permanently blacklisted. All data is (c) CentralNic Ltd (https://www.centralnic.com) Access to the Whois and RDAP services is rate limited. For more information, visit https://registrar-console.centralnic.com/pub/whois_guidance. Copyright © 2018 SitePrice.com. All rights reserved.